Missing too many short putts? Have a garage or closet full of old putters? Having trouble with your speed control? Maybe I can help you shed some light as to why. Often you will go into golf shops at a course and not see any clubs on the rack nowadays except for the putter. This is a quick sell for the man/woman who is having trouble with their putting and who thinks that buying a new putter will lead instantly to less three putts. Unfortunately, these putters will be the same length, lie angle, loft and weight as their last one. So what they are really buying is more of the same. People say that putting is half the game. It may not quite be a full half for a lot of people but it is most certainly the most used club in the bag. Does this not make it the most important to be fitted correctly? How many times have you been on the golf course and noticed that everyone has the same putting stroke? None? Me either. People are finally starting to come around to the fact that their golf clubs should be fit and built to their swing, body type and game style but they neglect to do the same for the putter. They consistently buy an off the rack, standard everything putter. A putter with the correct length and lie will get you into the correct set up position to enable you to make a good putting stroke allowing you to roll the ball down the correct line. It will also be fit to you for weight so that it will fit your natural tempo and give you more control over your speed. The head style should match your natural club path (big arc, slight arc or straight back and through). The most over looked part of the putter is the loft. The correct loft of putter for your stroke will allow the ball to be lifted out of the slight indentation in the grass and get your ball into a pure roll earlier. The standard loft on most putters is about 3 or degrees. Depending on how you set up to the putter and how you make your stroke this could be off by a lot for your particular stroke. 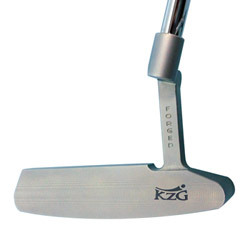 When you come to be fit for your putter at the KZG Performance Center your Master Clubfitter will analyze your putting stroke, body style and tempo. They will then fit you into the correct putter for YOU allowing you to putt better more often. Come down and let us prove to you why you need to be fit correctly for the most used club in your bag.